Tired of the good times slip-sliding away? The folks at DragonFire believe proper protection is important for any UTV, whether it is racing or recreation. This “better safe than sorry” philosophy has resulted in new “LockDown” harness bar and belt kits for the Can-Am Commander, Kawasaki Teryx and popular Polaris Ranger. Intended to provide protection far superior than the standard automotive-style lap belt, DFR offers a full 4-point harness specifically engineered to fit properly. The “H” style allows you to run the belts around the headrest, while staying firmly on your shoulders because of DFR’s uniquely designed sternum clip. Speaking of stylish designs, DFR’s belts are available in four colors, including silver. A full 3-inches wide, the thickly padded straps will keep you securely in your seat no matter how rough the terrain gets! However even better fit and increased security comes when the belts are used in conjunction wit the new “LockDown” harness bar. Starting with a 1 ¾-inch mild steel horizontally mounted harness bar, a three-bolt clamshell clamp as well as laser-cut plate steel shoulder harness trappers that make the bar strong, simple and very practical. 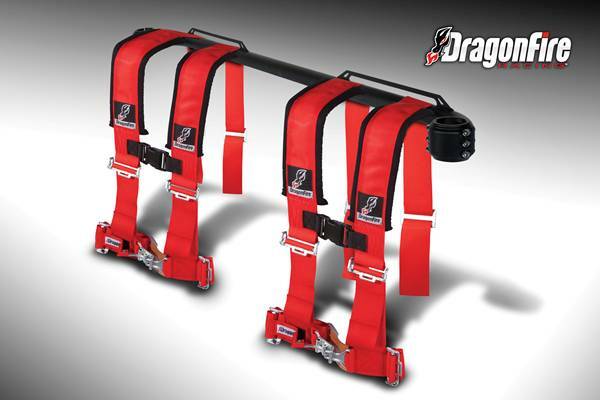 Don’t think of adding the “LockDown” harness bar as hard labor — it takes only minutes to install. It can also be powdercoated to match stock or aftermarket cages.